Over the last few weeks, UFC lightweight champion Khabib Nurmagomedov and fan favorite contender Nate Diaz have engaged in a number of skirmishes on social media. If you thought this might eventually lead to a fight between them, however, think again. Speaking on Submission Radio this week, Khabib Nurmagomedov gave his assessment of Nate Diaz and his 19-11 pro record. Safe to say he’s not impressed. Khabib Nurmagomedov last fought on October 6, in the main event of the record breaking UFC 229 pay-per-view, when he defeated Conor McGregor by fourth-round submission. With this impressive victory, the champion improved to a jaw-dropping 27-0 overall — easily one of the best records in MMA history. Nate Diaz, on the other hand, has not fought since August of 2016, when he gave up a close decision to Conor McGregor. This loss was preceded by a submission defeat of the same man. Diaz was briefly expected to return to the cage opposite Dustin Poirier at UFC 230 in November, but this plan was nixed when Poirier sustained an injury — at least that’s what initially thought. 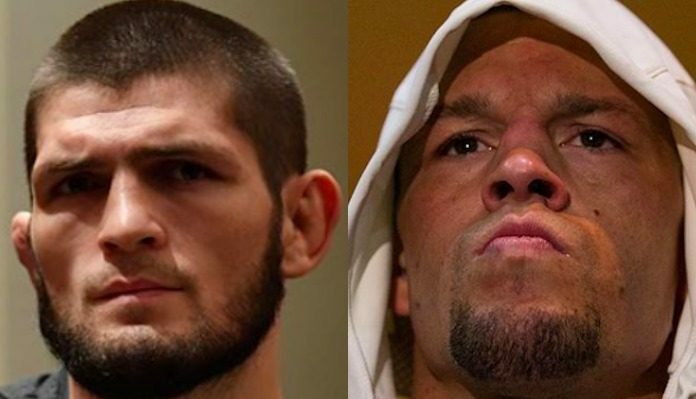 Do you think Nate Diaz and Khabib Nurmagomedov should settle their differences in the cage? This article first appeared on BJPENN.COM on 1/21/2019.